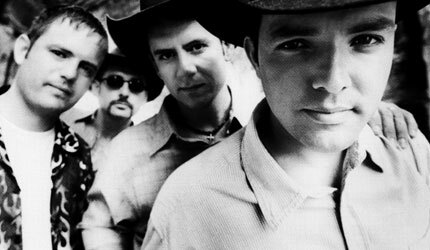 The Red Dirt blogosphere has been abuzz with the exciting news, first broken by our friends at txrdr.com, that The Great Divide is reuniting for a gig headlining August’s College Days in Stillwater, OK. More info about the event will be posted HERE in the coming weeks. The Great Divide were a revolutionary band. Their influence is still being felt across Oklahoma and Texas. The unique way they were able to mix lyrics that told a story with rock-infused country is still a blueprint that many bands are using. They had songs about raising hell, rejoicing in grace, falling in love, falling out of love and the hell that’s life on the road. They knocked open new venue doors for original music, kicked the tires in Nashville before it was a hip thing to do and made a collection of the finest albums to ever come out in this scene they helped foster. You should pick up all their albums. In honor of their reunion, we’ve assembled a playlist of our favorite Great Divide songs. These tracks are must-owns, and look for one to end up on The Drop soon! What’s your favorite Great Divide song? Will you be in attendance at College Days? You know that I wouldn’t miss this for the world…. and hearing Blue Skies and Never Could live again would make my millennium! I’ll definitely be there!! It’s a can’t miss! Break in the Storm has always been one of my favs! This is going to be the best. does anyone have the dates yet? Can’t wait! Seems like yesterday that me and all my friends were traveling all over Oklahoma watching these guys play. When I read this it made me smile. Before I ever found you crazy bunch….there was TGDivide.Lotta memories. I’ll definitely be there just for Great Divide since this will be my last time to see this amazing band play. I’m reluctant to go after the recent change of hands the venue went through; its just not the same. What are you talking about? Calf Fry was awesome according to what I thought and what everyone I know who went said. My friends who still live around there told me the place has been sucking for a few years and they seem to think the new people will bring it back. Besides, if the new owners can put together the original line up of TGD for their first College Days then they can’t be all bad! It’s really very complex in this full of activity life to listen news on Television, so I just use the webfor that purpose, and obtain the most up-to-date information. qQSa8e Way cool! Some very valid points! I appreciate you writing this post and also the rest of the website is also really good.